Is Dental Assisting right for you? Ready for a great career instead of an unrewarding job? Have you thought about becoming a dental assistant? Here at Texas Academy of Dental Assisting our students are top notch. Our students get many job offers before graduating. So why not join our school and get that fulfilling career you always wanted. Texas Academy of Dental Assisting wants to give a huge shout out to our student Magan Downs. Magan secured a job before graduation as an RDA for a pediatric office here in Fort Worth! Our whole TADA team could not be more excited for you Magan. Congratulations! Hey, Hey, Hey…what do you say? Abdiel Atherley is working as an RDA. Texas Academy of Dental Assisting is very proud to share that when Abdiel enrolled with our school ….he was working as a pharmacy delivery driver. We are flying high for him. He has landed a job with a general dental office in Fort Worth. They are very fortunate go get this young man. He impressed us all! Congratulations Abdiel! Keep smiling. Texas Academy of Dental Assisting wants acknowledge graduate student Cheyenne Conner. Cheyenne came to us as a lifeguard who had recently graduated from high school. She was ready to start a career and we were very excited to help her with this quest. Our whole TADA team is overjoyed for Cheyenne because she realized her dream and is working as an RDA for a general dental office. Congratulations Cheyenne! We miss you. Texas Academy of Dental Assisting is tickled pink for graduate student Shelley Lawrence. Shelley came to us as a business owner and was simply looking for something different. She always had the BEST attitude — you know the kind that her cup was half full not half empty. Our staff and instructors want to praise Shelley for her achievement in landing a new career position as an RDA for a general dentist office. They are lucky to have her. Congratulations Shelley! 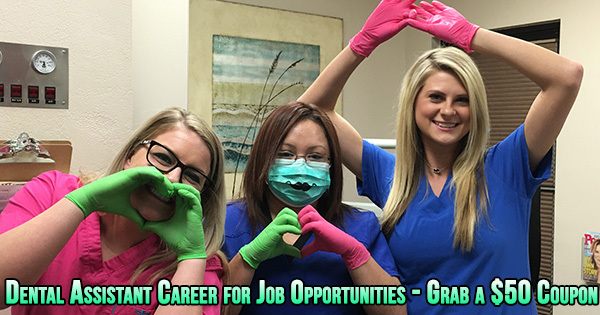 Are you ready for a life changing career and to see whether dental assisting right for you? If so then don’t wait…Email or call us at (817) 291-8078 today! Comments Off on Dental Assisting Right for You? – Try a New Career.